Every vote will be important in the forthcoming abortion referendum. It is therefore important that you make sure you, your family and friends can vote if at all possible. 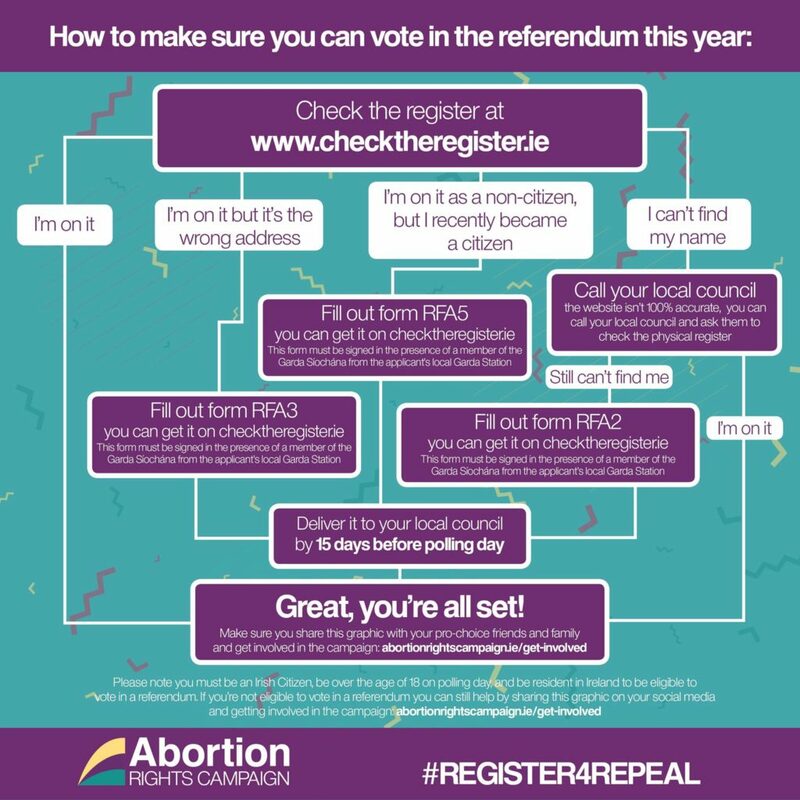 In order to vote in the upcoming abortion referendum you have to be an Irish Citizen, 18 or over on the day of the referendum, have been ordinarily resident in the state on 1 September in the previous year. The Draft Register of Electors is published on 1 November each year and comes into force the following 15 February. You can ask to see it in your local City or Council office, Post Office, Garda Station or Library; or you can check on line at www.checktheregister.ie. At this stage the Register is closed, however there are a number of ways in which you may still be able to vote, depending on your circumstances. If you find you are not on the register but are entitled to vote you can apply for inclusion on the Supplementary Register up to 15 days before polling day (Sundays, public holidays and Good Friday are not counted as days for this purpose). To be included on the Supplementary Register you must complete form RFA2. You are eligible for inclusion in the supplement to the Register of Electors on or after the day on which you reach 18 years of age. You can be included if this birthday falls after the closing date for applications but is on or before polling day. If you are within this category, you should accompany your application with a copy of your birth certificate. If you have moved address you can apply for inclusion at your new address by completing form RFA3. This will remove you from your old address. It is possible to be included on the Supplementary Postal Register 22 days (excluding Sundays and public holidays) before polling day by completing PVS1 if you have a physical illness or disability that prevents you from voting in person. Or by completing PVS2 if you are prevented from voting in person by reason of your Occupation, etc. To be included on this list you need to complete SVS1 22 days (excluding Sundays and public holidays) before polling day. I discovered I will be out of the country on 25th May for the repeal vote. Is it possible to vote online whilst away if I have my voting card with me? I’m also away on the 25th may so would like to know the answer to this aswel. I’m also out of the country on the 25th of May for the repeal vote. My husband and myself would like to vote if this is possible online or otherwise? I will also be out of the country on the 25 th may is there any possible way that I could vote before this date ? I will be out of the country for the referendum how can I vote, before I leave or by proxy or post. Away one the 25th, is there a way I can vote? Caroline Tulie 10/05/2018 I am also away on holiday and want to vote can someone give me any advise thank you in advance. Hi out of the country that day ! Can I vote ? I am also away for the vote. I am registered and also wondering if there is a way to still vote. Also. I.m away and would like to vote. Is it possible? It seems if you’re away on the day of the vote you lose your right to a say in the countries future unless you are a guard, diplomat or defense force member as those are clearly more important than other citizens of Ireland, good to know that not everyone’s voice is equal. Hi did anyone find out is there a way to vote if on holiday abroad 25th?